After several unsuccessful, though admittedly last minute, attempts to dine at San Francisco’s lauded State Bird Provisions, I finally bit the bullet and planned two months ahead to secure a table at this bustling establishment. Although State Bird reserves a portion of their tables for walk-ins, competition is fierce; when I arrived in the neighborhood around 5pm, the line was already halfway down the block. 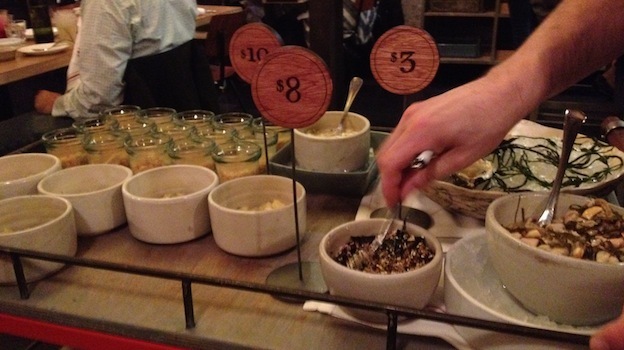 Since opening on the last day of 2011, State Bird Provisions has been surrounded by a relentless buzz. Owned by husband and wife chef team Stuart Brioza and Nicole Krasinsk, State Bird has already earned a Michelin Star and been nominated by the James Beard Foundation twice, first as the best new restaurant in the country in 2013 and then as best chefs in the West in 2015. While such luminous accolades might call to mind visions of white tablecloths and candlelight, the reality is actually quite the opposite. Serving what is best described as haute international dim sum, State Bird Provisions is intimate, though loud, and almost aggressively informal. Casually attired servers and the occasional cook serve the majority of the restaurant’s food on trundle cars they push throughout the dining room. Guest have an opportunity to see dishes before making a decision, which adds a kind of frenzied timing to the meal; the carts come by often, and the auction-room energy and alluring presentation can easily force your hand, leaving you with a lot of food, fast. But for people like me who want to eat off everyone else’s plate in order to try as much as possible, this style of dining is pure bliss. It is also incredibly fun. This element is not to be discounted as, in my experience, a restaurant is either entertaining or it is profound; rarely have the two qualities coexisted as well as they do at State Bird. Of course, the lack of coursing and the wide-range of flavor combinations employed by the kitchen can make selecting wines something of a challenge. On hand to assist is wine director Jason Alexander and his two sommeliers Marie-Louise Friedland and Betsy Ross, who is technically in charge of wine service at State Bird’s sister restaurant, The Progress. Because the two restaurants share a single space, guests who are in-the-know can order wine off of either list, which is exactly what we did. State Bird’s list is small but smart, with a focus on aromatic whites and lighter reds. The list at the Progress, on the other hand, is far more developed, with an extensive selection of domestic wines featuring some of California’s newest and most exciting projects, as well as terrific selection of Rieslings, and a limited but compelling ‘Reserve’ section, for those looking for wines with age. My approach to ordering wines in such an eclectic setting was to deliberately seek maximum versatility. Specifically, I mean reds that are neither too tannic, extracted, nor aggressive, and white that aren’t heavily oaked. Neither should be too high in alcohol, and a bright acidity is ideal. With these stipulations in mind, we began the meal with a Grüner Veltliner from Tegernseerhof and a Nero d’Avola from COS, a Sicilian producer known for creating lifted, energetic reds. The Grüner was a study in minerality—aromatically subtle but texturally deep, with a resonant, rocky palate and a nose of meyer lemon, tarragon, and flint. The COS was aromatic and charming, with a nose of sweet cherries, felt pen, and leather and a focused but bouncy palate. Though the COS was utterly delicious, it quickly became clear that the majority of the dishes—at least the ones that we ordered—worked far better with white wine, and so we corrected our course back in that direction. The next flight was particularly exciting as both were Smaragd Rieslings from the Wachau, though from different producers and separated by 11 years. Hirtzberger and Prager are two of Austria’s most lauded estates, and both are highly-regarded for producing wines of incredible power and finesse. 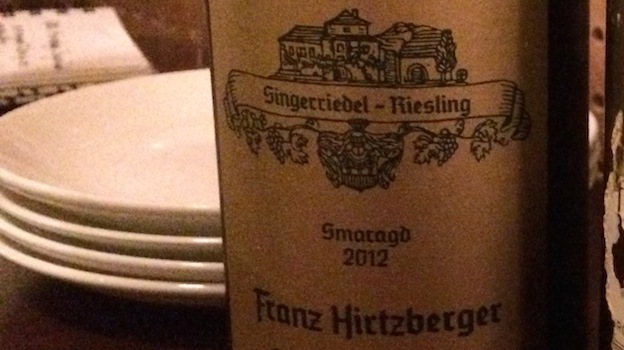 The 2012 Hirtzberger Singerriedel was incredible. The nose was a compelling combination of lime skin, tangerines, chamomile, scallions, and white flowers. In the mouth it was long, dry, and focused, with a rocky undertone and an exciting touch of kumquat-bitterness in the finish. The 2001 Prager Achleiten, which came from a friend’s cellar, was singing. Rich but bright on the palate, with a texture redolent of olive oil poured over chalk. Though still very much a youthful wine, the aromatics were just starting to develop some interesting secondary notes, with a bit of honey and diesel rounding out the more high-toned tones of mandarin orange, sage, and oyster shell. As they were equally matched but thrilling in their differences, we enjoyed both wines simultaneously, darting between to test their compatibility with each of the many dishes we ordered. The vast majority of the food we ate was grabbed off the passing carts. Highlights included the smoked trout parfait with uni sauce, which was served in a small jar and offered briny bites of pure pleasure. An amazing and new (new to me, that is) combination of sea life, the dish perfectly combined sweet trout flesh with the saline tang of the uni. The Hirtzberger, with its low mineral tone, was the perfect accompaniment here. The potato, shellfish & pickled seaweed porridge was my favorite dish of the night by a mile. Balanced and interesting, with high-notes from the seaweed playing off the hearty potato, this dish was simultaneously comforting and thrilling. Both wines worked well here, but the Prager, with its more cushioned acidity and the warm flavors of age, hit on all levels. 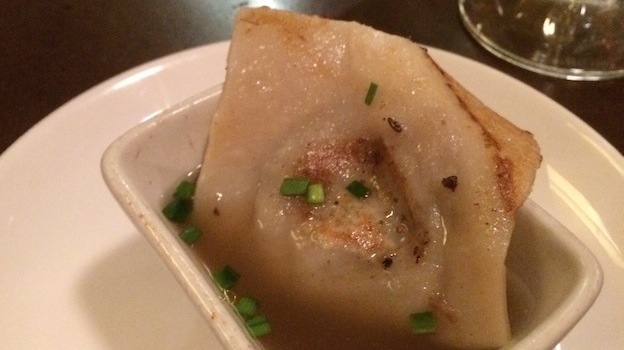 The Guinea hen dumpling in broth was another high point, and I’m told it’s regarded by many as a not-to-miss dish. The stuffing in the dumpling was rich and a bit gamey, but the broth was counterbalancing in its lightness, with subtle hits of lemon and ginger that highlighted the youthful spirit of the Hirtzberger. The duck liver mouse may have been whipped and airy, but its creamy texture and savory/sweet flavor was pure decadence. Spread on top of biscuits, the dish was sensational, though it really called for a wine with a bit more sweetness than anything we were drinking. In addition to the array of cart food, State Bird Provisions also offers a traditional paper menu, which features a selection of more classically plated entrées, as well as a handful of bite-sized, savory pancakes. We ordered several pancakes as well as the actual “state bird”—a intensely battered and fried quail dish set upon a layer of lemon-braised onions, but the powdered sauerkraut and cheese pancake the was the standout. This creative dish was loaded with punchy flavor, which was perfectly balanced by the broad and honeyed texture of the Prager. 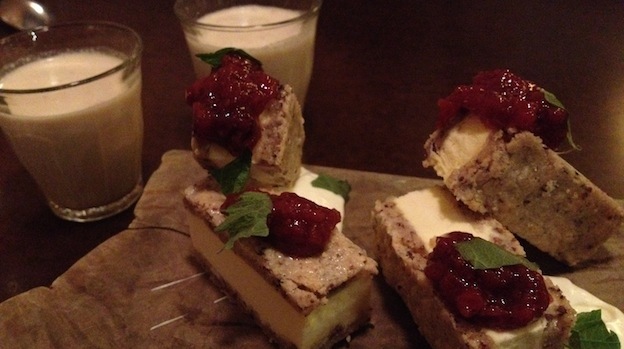 For dessert we had the ice cream sandwich accompanied by shot glasses full of peanut muscovado milk, which put a playful punctuation mark on our exceptional meal—one of the best I’ve had in recent memory. 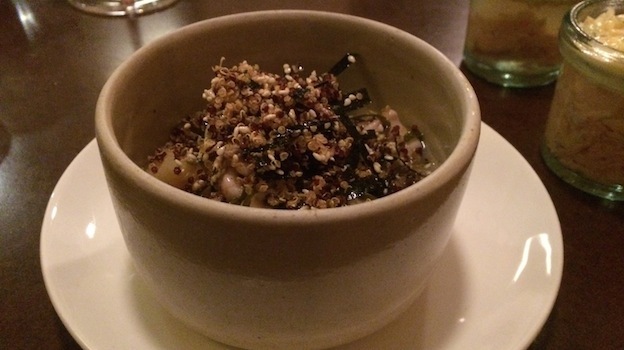 Of truly singular vision, State Bird Provisions is well deserving of its fame.